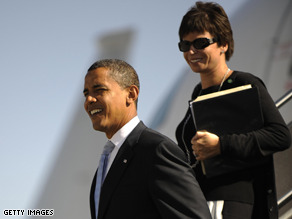 Jarrett met Barack Obama when she hired his wife Michelle for a job in the Chicago mayor's office years ago and has be very close to the two of them ever since. The transition team also made official Saturday the hiring of Ron Klain as chief of staff to the vice president, a story CNN first reported on Thursday. Klain was also chief of staff to Vice President Al Gore, but he's no stranger to Vice President-elect Joe Biden, having served as chief counsel to the Senate Judiciary Committee when Biden was the committee chairman. Klain also served as general counsel of Gore's 2000 Florida recount effort, and was portrayed by actor Kevin Spacey in an HBO movie about the event. This year Klain helped with debate preparation for both Obama and Biden. government, as well as a unique understanding of how the Vice President's office works." The transition team also announced Saturday that Phil Schiliro will serve as assistant to the president for legislative Affairs. Schiliro is currently director of congressional relations for the Obama transition team. Before that he was a senior adviser to Obama's presidential campaign. Schiliro has worked in Congress for more than 25 years, in positions including chief of staff to Rep. Henry Waxman, D-California, and policy director for then-Senate Democratic Leader Tom Daschle of South Dakota and staff director for the Senate Democratic Leadership Committees. President-elect Barack Obama's White House chief-of-staff Rahm Emanuel has apologised to the US-Arab community for remarks made by his father. Yes Brad and Rudy – because men and women cannot work together without relations. And she is not a qualified or proven confidant and advisor to the President Elect. He is clearly just after some tail. Bravo detectives. You are a gleaming example of the sad lows of society. Im sorry for posting CNN,I forgot it was Saturday,and all posts are either discarded, ignored or even deleted for some reason.Maybe its some kind of Political bias by the moderators or your just to cheap to hire more folks for the job. Divided we fall, United We Stand. Hate, discrimination, jealousy and all these negative responds and attacks towards President -Elect Obama is totally nonse and inapproptiate. Not what America has done for you, but what you have done for America instead of discriminating with hate and negative attacks and plans against each other. It looks like he's bringing in the best and the brightest, and avoiding the Arabian horse trainer types. Thank goodness. Greg h – if you haven't noticed already, with 8 years of Bush & Co. at the helm there's not much left to wreck. Will you all just give the man a chance ! Who did you expect him to appoint Rush Limbaugh? It's his vision, leadership, ability to think out of the box, his management style and decision making that will make the difference. Give the man a chance to form his administration and stop reading something horrible into everything he does. If you want to criticize, than go after George Bush who is leaving this country in such a mess. Bush is still President and there is a lot he could/should be doing to help the American people before he leaves office. Obama has appointed people he has had personal experience with over the years, people whose integrity, talent, and depth of experience has been tested over time, and whom he obviously trusts and respects. Bush and his personal friends and cronies have ALREADY brought this country to its knees. Here's another thing to "hope" for with an Obama presidency – let's hope his administration doesn't turn into a "group think mentality" because familiarity breds blind spots. Why do I see so many people who harped on Obama's "lack of experience" demanding that he surround himself with inexperienced people? I think some people just need to complain, and don't care at all about being consistent in what they say. President Obama has won the election now we must give him the opportunity to put together an administration to govern the country. We did not get into this problem in 1 month but several years at least give him 36 months to get it turned around. The GOP had control of all 3 branches of government 12 years house 8-10 senate Peresident 8 and we gave them all the time they needed to screww everything up. As Philip Schiliro's former college teacher at Hofstra U., and a long-time friend, I congratulate President-elect Obama on that appointment, and ,of course, also Phil S. Philip is uniquely qualified by experience as well as eminently fit by an admirable character, to deal with his coming responsibilities. He will stand at one of the institutional points of friction between the Presidency and Congress. I predict that we will all be pleased by the way he will handle that responsibility. We Won! It is obviously those of you that are complaining are in the minority. Get over your BIAS and IGNORANT thinking.Some of you will benefit from President elect Obama's economical change to help everybody, more so than some of us that VOTED for him. Get over your whining and move on. PLEASE CANCEL "D.L. Hughley Breaks the News," !!! CANCEL THIS SHOW NOW !! THE MOST TRUSTED SOURCE !! It appears that Fred Flintstone is afraid of smart people. He's for the bimbo,Palin person(lol).All the paople he has chosen are brilliant!As Castro stated, iy's going to be hard to change racism that consumes many Americans. If you learned nothing from Bush, then you are in that number of racists. Bush needs to leave office ASAP. He is doing more and more damage before he leaves. I guess this is his mission. Ignorant people like you should stand in the corner and go to timeout for awhile. That's the kind of punishment children get. When you grow up then you could come conversate at the adult table. But for now your in timeout. Like the later Eleanor Roosevelt said: 'Great minds discuss ideas; Average minds discuss events; Small minds discuss people. Clearly, its easy to see what kind of mindframe you possess.